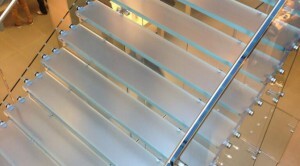 Glass staircases are becoming increasingly more popular with many retail establishments and it is easy to see why. The style is perfect for open concept floorplans that accentuate the building’s lighting, whether that light comes from the sun or a bulb. The glass staircases are typically transparent often with a frosting or tinting, although opaque glass is occasionally used as well, meaning that light is allowed to pass through the staircase, which brightens the room and makes it look larger. In addition to the aesthetic benefits of a glass staircase, there are several financial benefits. Installation costs are comparable to other staircases and since the glass stair pieces are shipped over for installation, there is a lot less mess that will interrupt your business. For more information and to discuss the specifications of your business’s needs including a free consultation and price quote, give our glass experts a call, send us an email, or fill out our online form and one of our consultants will happily answer all of your questions.